This week I want to share with you my Big Winter Shawl v3. I call it that because it seems that every Winter I get the urge to knit a big colourful woolly shawl to wear. This is the fourth time I've attempted it, but the third time I've succeeded. Previous editions are a a striped More Than a Triangle Shawl, the never finished Modern Quilt Wrap (which I will finish one day) and a big orange and grey version of Pterotactyl. 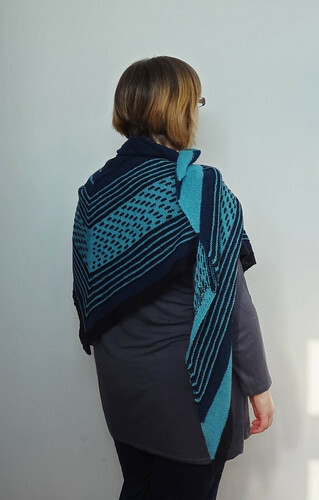 This year's version is the Ridgeland Shawl by Marc Smollin, who also designed Pterotactyl. This gigantic shawl was cast on in October and it ground to a halt during the stranded section. 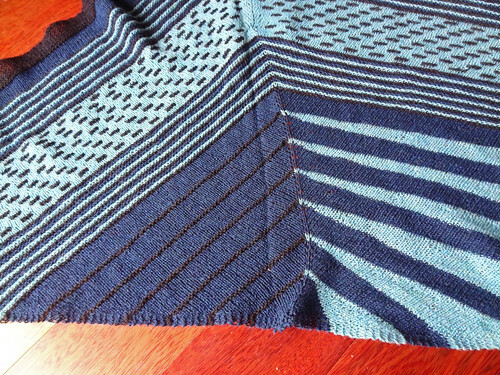 I did not enjoy this section of the shawl, I'll explain more in a minute. The shawl was designed using Holst Garn Supersoft 100% Uld and I decided to use that yarn as it was one I hadn't tried before, and I'm always on the lookout for nice and woolly yarn. I managed to find it at one my favourite online shops, Tangled Yarn. I think what swung the yarn choice for me was I had a voucher to use for this shop, so it seemed a good idea to use it to get my shawl yarn from there, especially as I couldn't seem to find it elsewhere. The colours I chose were Aquamarine,Graphite and Mariner. The yarn is made of 2 loosely spun plies of wool, which feel thin because of the oils that coat the fibres. Once the yarn is washed, the oils are removed and the yarn blooms. If I was to make this shawl again, I would choose colours with a wider difference in colour values than the Mariner and Graphite had. It's hard to judge values properly using a website. Those colours blended a bit too closely for my liking, though I still love the colours. The shawl is an unusual shape. From the centre point to the right hand tip it measures 32" (0.81m), but from the centre point to the left hand tip it measures 56" (1.42m), which gives a total wingspan of 82" or 6'10" (2.08m) and the depth of the shawl is 33" (0.84m). 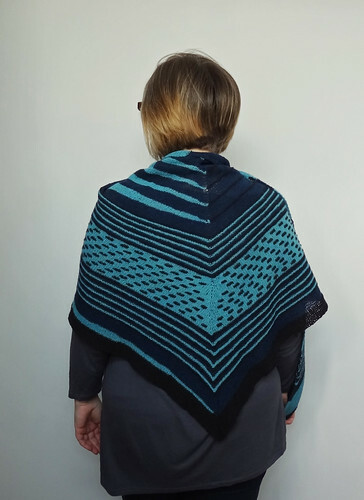 The size of the shawl is what attracted me to it in the first place but if I'd thought before I started, I would have swapped the sides of the shawl over as I prefer to have the right side longer on asymmetrical shawls. My shawl is also larger than the pattern states. I should have reduced my needle size, as I usually knit looser, but I didn't swatch, because I never do for shawls, and I didn't think. The result of this larger gauge is a more airy shawl, which is probably better for warmer weather but not as snuggly as my Pterotactyl, which is knit in Kauni, a sport weight yarn. 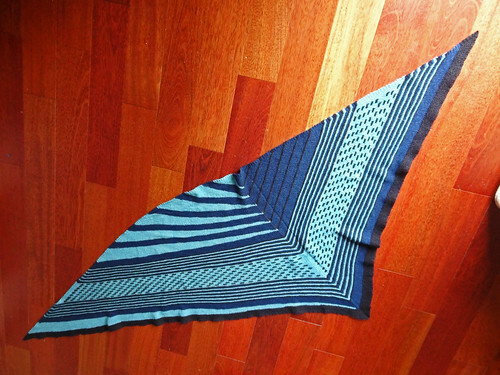 The enormous wingspan of this shawl meant I had to fold it in half to block it. 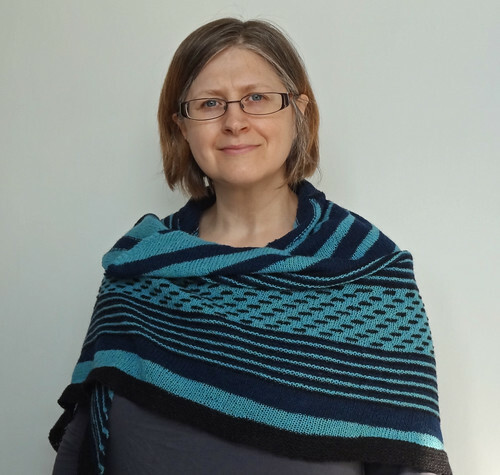 When folding I didn't take into account the curved nature of the centre line of the shawl, which means I have a fold line in the shawl that is distinctly visible. I may have to steam it out. This curved centre line means, despite blocking the top of the shawl perpendicular to that line, the left hand side of the shawl curves up. This makes it a little hard to wrap around without displaying the wrong side of the knitted fabric. You can see how the top wants to fall forward. I'm also not happy about the way the back looks, because the stranded part of the shawl doesn't look "right" to me. The black dashes don't seem to sit in the right places, which I'm sure is down to me having an off stitch count, rather than the pattern. As I said earlier, I did not enjoy the stranded part of this shawl. I wasn't expecting to hate it, because I like stranded knitting. What I didn't take into account was how long these rows were going to be and how annoying it is to k3 in one colour and then p3 in the other colour. This stitch pattern is what is carried out on the wrong side rows and it drove me mad for some reason. The reason this shawl took so long was my lack of desire to finish the stranded section. It sat half done for months. In the end I had to make myself do it by rewarding myself for finishing a repeat, and only then allowing myself to work on another project for a day or so. I don't often have to force myself to knit, but I was determined not to be beaten by one section of the shawl. Over all, I am using this shawl a lot for round the house. I think it is a good weight for this time of year, and it does wrap me up nicely because of it's size. It also matches the colours in my lounge nicely, so it's pretty draped over the sofa. I probably won't wear it out and about because of the little niggles that would drive me crazy out in public. To be honest, I have more than enough shawls that I adore to wear out in public. This will make a very nice "sofa shawl", but I won't be making it again, despite having lots of the yarn left over. 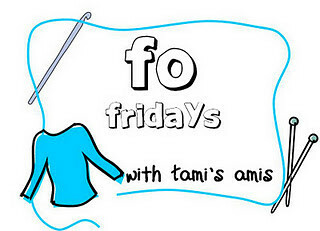 As it's a Friday, I will be linking this post up to Tami's Ami's & Other Creations. To see other finished objects, click on the button.